Home Basic File Questions How to create new file inside directory in Java? Write a program in Java that creates a new file inside a given directory. We can solve this problem with the help of mkdir() and createNewFile() methods of File class that is present in java.io package. We will use following two constructors of File class to create file class instance. Validate drive letter and file name. Drive letter should be character and file name should have proper extension, for example - .txt, .pdf, .doc etc. Check whether given directory already exists in given drive or not? If directory exists then no need to create new directory otherwise create directory. Check whether given file exists in given directory or not? If file exists then no need to create new file otherwise create file. * @problem How to create new file in given directory? // If directory doesn't exist then creating a new directory. // Checking whether file exist or not in given path. 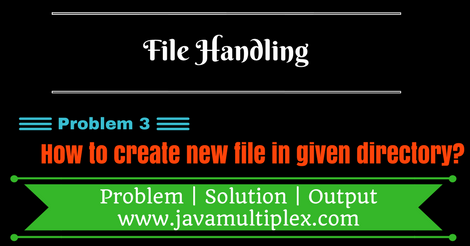 Output - How to create a new file in given directory in Java? file "demo.txt" in directoy "E:\javamultiplex"
Tags : File Handling, Create new file in directory, if else, Scanner, BufferedReader, File, String, Regular Expressions, InputStreamReader, java.io, mkdir(), exists(), createNewFile().